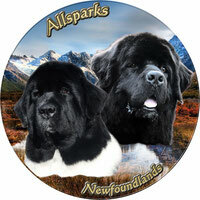 The newfoundland possesses a long and dense hair with a plentiful sub-hair what allows him to live under very rigorous climates and to bathe in any season. To the puppy the dress is woolly, very fine in the touch, homogeneous. It is only towards the age of 6/8 month that hairs change to become sound adult's hairs. A regular maintenance is imperative for this type of dog if we do not want to have problems of skin: pyodermite, dry eczema. It is advised to maintain regularly its dress, it is necessary to brush him regularly to eliminate the dead hair which prevents the skin from breathing and from being aerated. It is advised to use a velvet swimming crab with long teeth to penetrate well into the already dense fur. To aerate under hair and the skin, a regular blowing is the good solution. A simple hairdryer (with exit with cold air) can be enough to blow him in brush back hairs. Never to brush in brushes back hairs it breaks hairs. For knots use a comb wide-toothed comb. 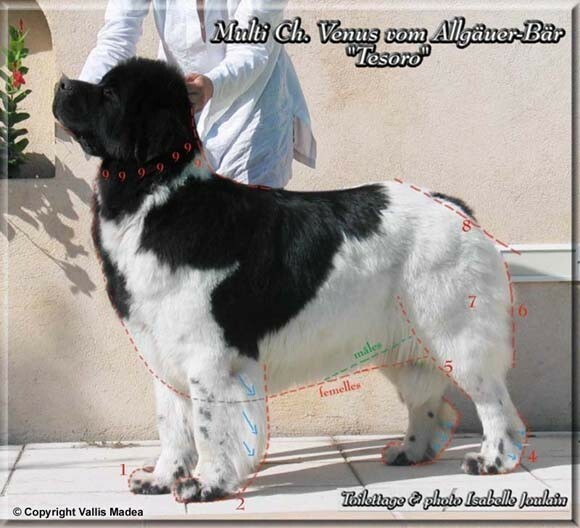 It is recommended to wash his newfoundland with a shampoo adapted to eliminate the dirts and the other parasites responsible for problems of skin. We can wash his newfoundland so often as necessary, the wash no démature not his hairs. For that purpose, it is necessary to use a neutral and specific shampoo to protect sound under hair. It is necessary to accustom him very young be brushed and washed! The puppy must not be washed as soon as it arrives home not to perturb him from its arrival to the house. Indeed rinse his dog in the clear water after a bathing in salt water. 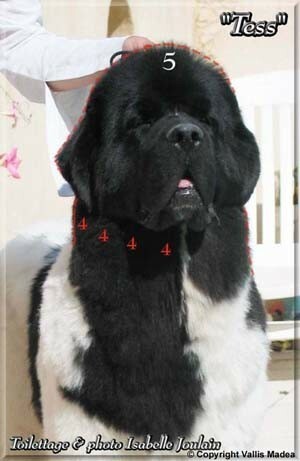 The regular maintenance of your newfoundland can seem binding but makes regularly it will avoid you many problems of health. Thanks to Sandrine (Vallis Madea) to have allowed me to use these grooming advice. It is with the following advice that I began the grooming. Right scissors, scissors sculptors, curved scissors, brush and some lacquer. Always cut on an clean and dry hair. Never on wet hair. To wash the dog watches over it. When the hair is still wet to vaporize the air-conditioner then to dry, if possible for the pulseur to look of the volume. Disentangle and wait for the next day for the cup. We begin with ears: it is necessary to bound the outline of ears with the rightscissors (1 and 2). We disthicken the top of the ear ( 3 ) with the sculptors (1 straight blade and 1 notched) by leaving in the bottom upward up to the tie of the ear (the point of the ear must be velvety). It is also necessary to thin out to the sculptors the zone situated behind the ear ( 4 ) to loosen the ear: the ear has to form a triangle. 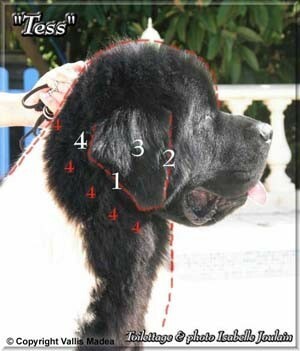 Disthicken also under the ear and all the zones marked "4" to loosen the neckline. Then to brush the hair on the right skull (from the occipital bone), to lacquer to maintain the hair ready may cut in the right scissors by training one rounds off who joins the base of bot. Under feet: it is necessary to cut the hairs which overtake between small cushions (in short of the small cushions). Delete and equalize the hairs which overtake on the sides of fringes with the sculptors (in the direction of the blue arrows). Of profile fringes have to be in the continuation of the leg (of face fringes do not have to exceed the shoulder (3)). Equalize the back of fringes ( curved scissors) to form a roundness which joins the foot (2). Fringes: idem fringe before (see blue arrows). Equalize points behind by following the red dotted lines ( 4 ) and round off the back of the volume with the curved scissors. Cut the surplus of hairs on the roundness of the thigh (curved scissors and sculptors for the finishes) (5). Also for the convex of the thigh ( 7 ). For males: the line slightly has to go back up towards the back ( green dotted lines). It is necessary to round off the breast with the right scissors (curves to begin). Begin by disthicken the top with the sculptors ( 9 ): the base of the neck must be almost flat. Then round off the breast ( 10 ). The line of the breast has to join the line of the stomach. Of profile we must be able to draw a line ( grey dotted lines) between the bottom(stocking) of the breast and the line of the stomach. Disthicken also the back of the neck ( 9 ) to loosen the neckline.